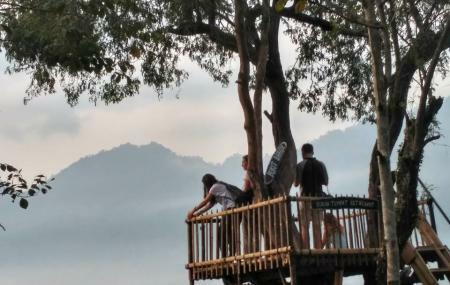 The Bukit Barede hill at the desa Karangrejo is one of the less crowded and lesser known spots which can be best explored on foot or on a motorbike. From the parking lot, you will need to traverse through the stone and cement laden path to the summit –the route being easy to moderate, will take around ten minutes. Reaching the summit of Bukit Barede, you will be treated with the stunning vistas of the Borobudur along with Merapi, Menoreh and Merbabu mountains. From the substations and tree houses, enjoying the ethereal sunrise and sunset would be memorable. The ornamental plants as well as the yellow and orange marigolds along the path will give you company. Easy hike, not crowded for sunrise view. You can also see Borobudur from afar. Not worth the reference to Borobudur and therefore also not the money. It's 2km away and borobudur is not very well visible due to a hotel and hill being in between (see photo) . Tree top viewpoint is perhaps better, but was already occupied when I got there. For a sunrise with views of the valley it's quite good though. Beautiful spot to see sunrise and Borobudur temple, not so long tracking, very kind staffs there, You better bring your tele lense. a bit expensive for foreigner.. This place was supposed for a sunrise tour. Good thing about it is that there's only a short hike getting to the top. It's nice only if the sun rises on the day you go there, if not, your sunrise tour will end up like a mountain in a mist (picture below). So, good luck!